With $135.99 billion in annual revenue in 2016, Amazon leads the online retail industry in sales and shopper engagement. As of 2016, the e-commerce giant carries more than 12 million products directly and 340 million products from third-party sellers. Internet retailers – from small businesses to enterprise corporations – looking to boost profits and build brand awareness can benefit from tapping into Amazon’s unmatched customer base. In this high-volume marketplace, great product descriptions are the key to visibility and conversion. Adherence to Amazon’s product description guidelines and a basic understanding of the platform’s ranking algorithm are important as you create concise, optimized descriptions. “Customer Obsession” is one of Amazon’s core values, encouraging leaders to start with the customer and work backwards. This approach can be applied when writing product descriptions as well. Before you begin, determine who your target customer is and why your product matters to him. Read customer reviews of similar products on Amazon to gauge consumer sentiment, and use this data to craft a product description that proactively addresses customer concerns and highlights features they care about. With more than 2 million third-party sellers on Amazon, all of whom are competing for the Buy Box in their respective categories, it is critical that customers do not lose interest in your product halfway through the description. Irrelevant or disorganized content will drive shoppers to the next listing. Be concise, specific and compelling; a great product description engages the customer with clearly defined features, a distinct competitive advantage, and a call to action. Amazon’s commitment to a positive customer experience is evident in the weight given to its customer review platform. Features such as Amazon Verified Purchase and Amazon Vine are designed to help consumers make informed purchasing decisions. With that in mind, descriptions should be accurate and focused on the tangible selling points of the product. Exaggerating your product’s capabilities or its benefits hurts your brand credibility when negated by actual customer feedback. Avoid subjective superlatives (i.e. “fantastic dishwasher”) that offer no concrete value to the shopper and can be easily refuted by a dissatisfied customer. When a customer searches for a product on Amazon, the application’s A9 algorithm determines which products display as results. 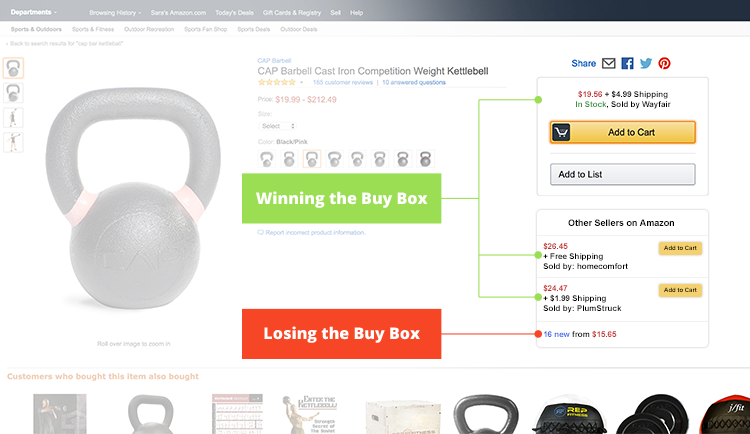 Amazon uses two data filters for ranking products: performance and relevance to the customer. Performance factors include conversion rate, images and price – all indicators of how likely the product is to generate profit for Amazon. Relevance is determined by the product title, brand, bullets, description and search terms. When it comes to optimizing your descriptions for Amazon’s search engine, there’s no real benefit to using any one keyword multiple times on the page. It’s more beneficial to integrate multiple related keywords, as long as the description flows naturally and the content is relevant. The algorithm penalizes keyword stuffing in the title or description, but you can include additional keywords in the Search Terms, Subject Keywords and Style Keywords fields on the backend of the page. By creating your product descriptions with search in mind, you show up more frequently in results, which leads to higher click-through and conversion rates. Be accurate. False information related to product identification, specifications or features is prohibited. Be safe. Include any necessary health or hazard warnings required to meet North America product safety standards. Be considerate. Obscene or offensive content, information that spoils the plot for literary or cinematic products, and solicitations for positive reviews are all prohibited. A 2016 BloomReach study showed that 55% of online shoppers in America begin their product search on Amazon, presenting a tremendous opportunity for internet retailers looking to expand capacity and boost sales. In order to position your business as a trusted Amazon marketplace seller, you must produce high-quality product content that resonates with customers and influences their purchasing decisions. Looking for support in this process? Discover how OneSpace’s hand-curated teams of freelance e-commerce writers can help you create quality Amazon product descriptions at scale.